There are all sorts of seafood stews – bouillabaise from Marseilles, cioppino from San Francisco. 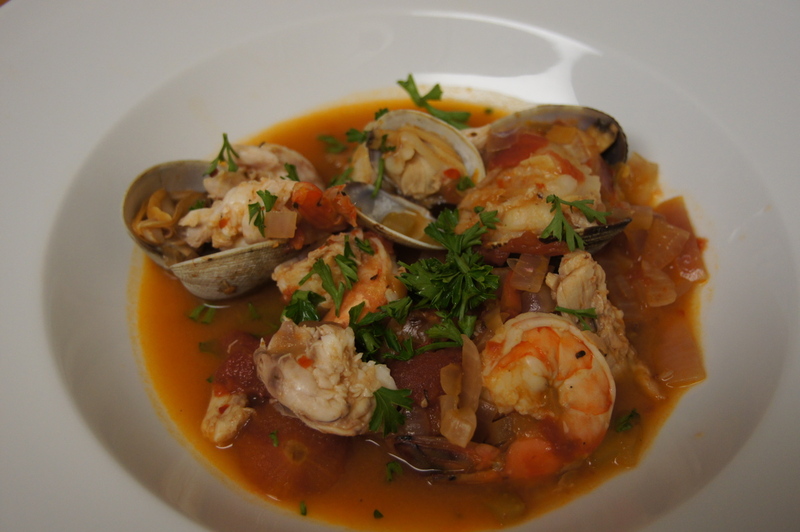 In Molto Italiano, Mario Batali published a recipe for Zuppa di Pesce, an Italian seafood stew from the Amalfi coast. Unlike bouillabaise, which requires fish stock and the bread-based thickener rouille, this Zuppa di Pesce is simple to make. First saute some aromatics (onion, celery, garlic) with some red pepper flakes. Then add two cups of tomato sauce, two cups of white wine (Trader Joe’s Two Buck Chuck is what I use for cooking wine) and whatever combination of fish and shellfish you want. 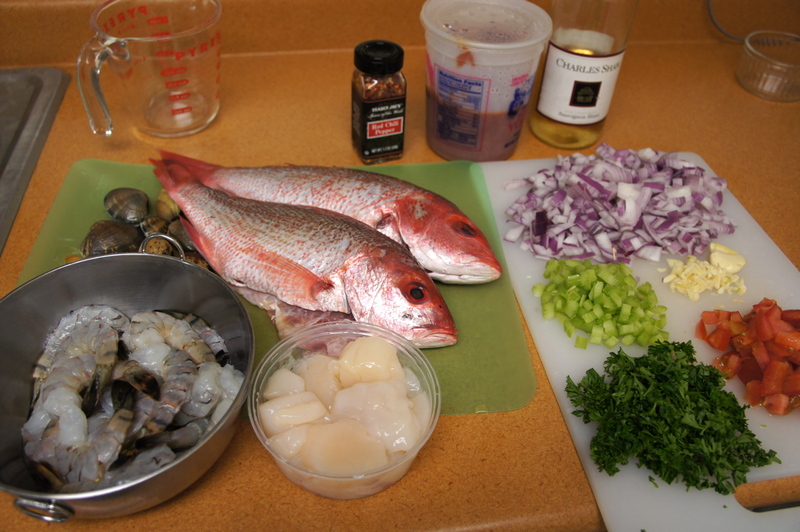 The recipe calls for red mullet, langoustines, shrimp, clams, and mussels, but I used what was available at the local grocery store: a whole red snapper, scallops, shrimp, and clams. The seafood cooks for about 5-10 minutes. Top with some parsley (and marjoram if available) and serve with some toasted fresh bread rubbed with a little bit of garlic. The whole fish broke down in the soup, leaving a lot of bones, which add flavor but make the eating a bit messy. An alternative would be to use some cut-up fish fillets. I used Chef Batali’s basic tomato sauce, which is a really good version that adds carrots for sweetness and is (untraditionally) seasoned with thyme. I add about a tablespoon of salt to the basic tomato sauce recipe. Simple, healthy, fresh, and lots of flavor. 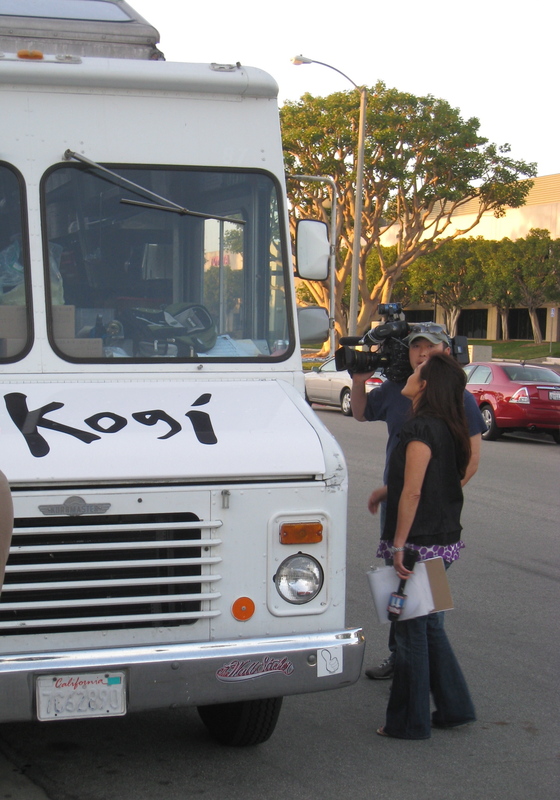 I first became aware of the burgeoning food truck movement from a New York Times article in 2009 about Roy Choi’s Kogi BBQ Korean taco truck in Los Angeles, CA that was causing a sensation with its fusion of Korean barbecue and Mexican tacos. I had to go down to LA that summer and check it out. I found the location of the truck, in an industrial park south of LA, on their website. There was an hour-long line and a news crew filming the scene. 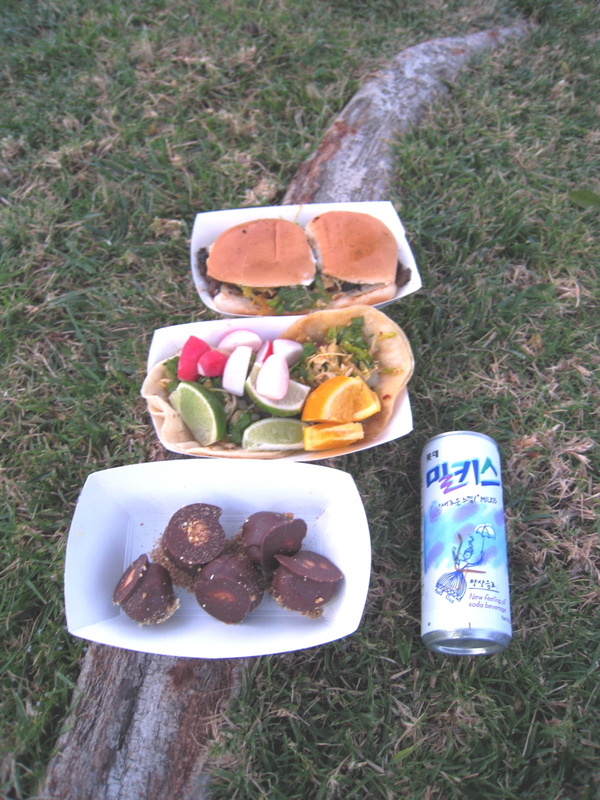 They had Korean barbecue (pork, chicken, kalbi) tacos and sliders that were delicious. 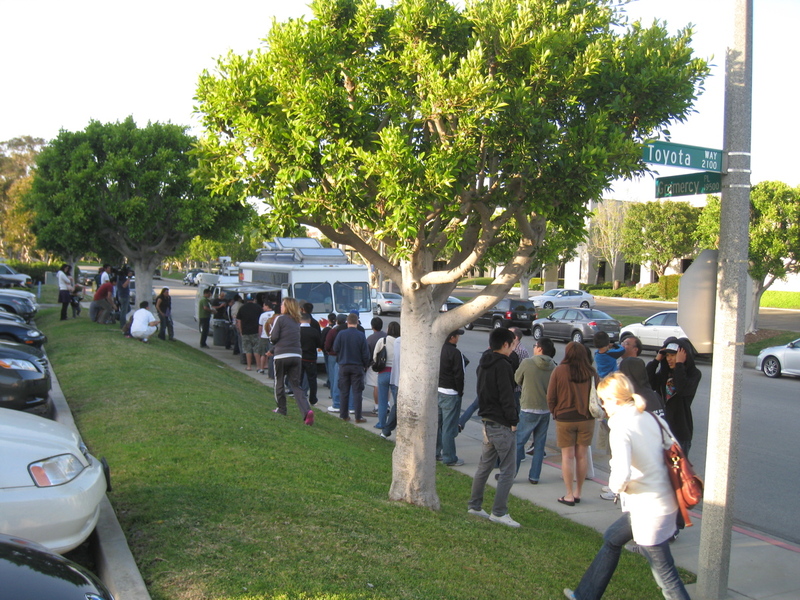 It seemed shortly thereafter that the food truck movement in the Bay Area really exploded. 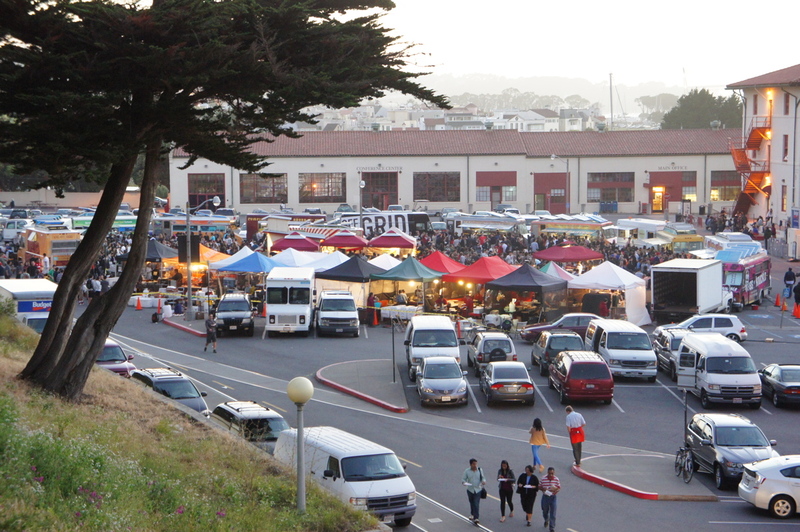 In 2010 the Off the Grid group began organizing a food truck event on Friday nights at Fort Mason in San Francisco, where around 30 trucks gather from 5-10 pm. It’s great fun to be able to try so many different trucks. 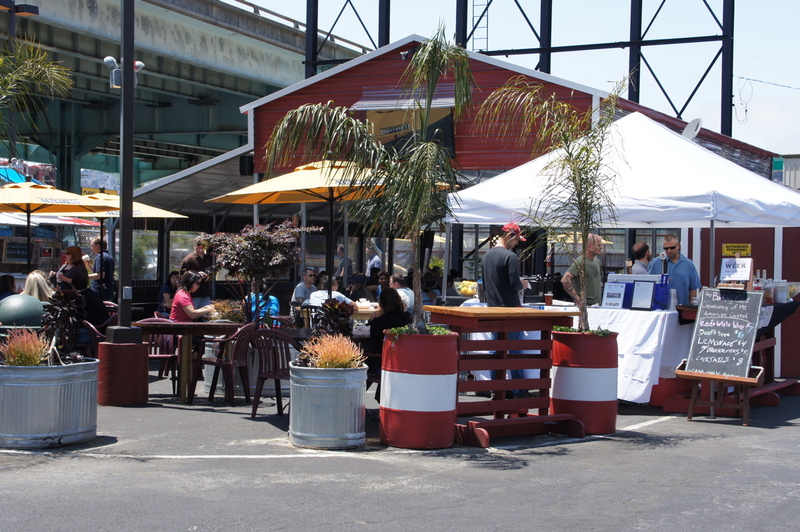 Off the Grid now holds a host of other gatherings in San Francisco and other locations in the Bay Area during other days of the week. The downside of Fort Mason is that the lines are often long, it gets cold on Friday nights in the City, and there are not that many dedicated facilities (tables, bathrooms). 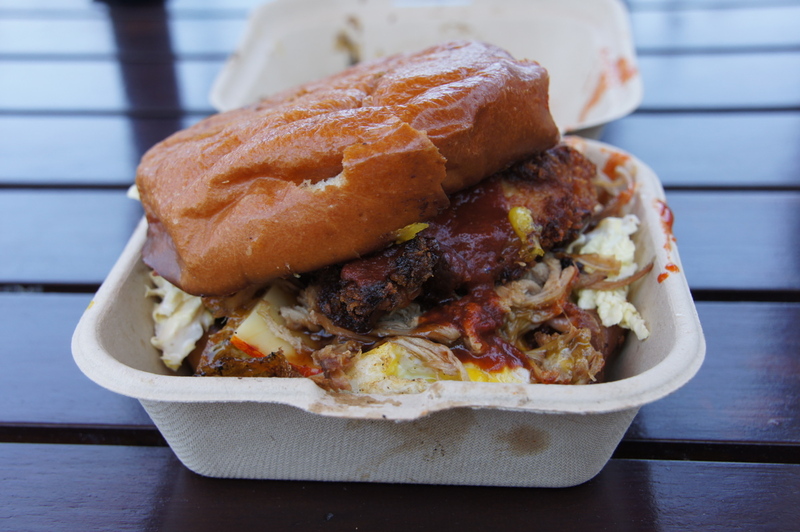 In 2012 the new StrEAT Food Park opened in the SoMa (South of Market) neighborhood, on 11th street near US101. It’s loosely modeled after the food truck “pods” found in Portland, OR. There are clean bathrooms, indoor and outdoor seating areas, sometimes a bartender, and up to ten trucks for lunch and dinner seven days a week. 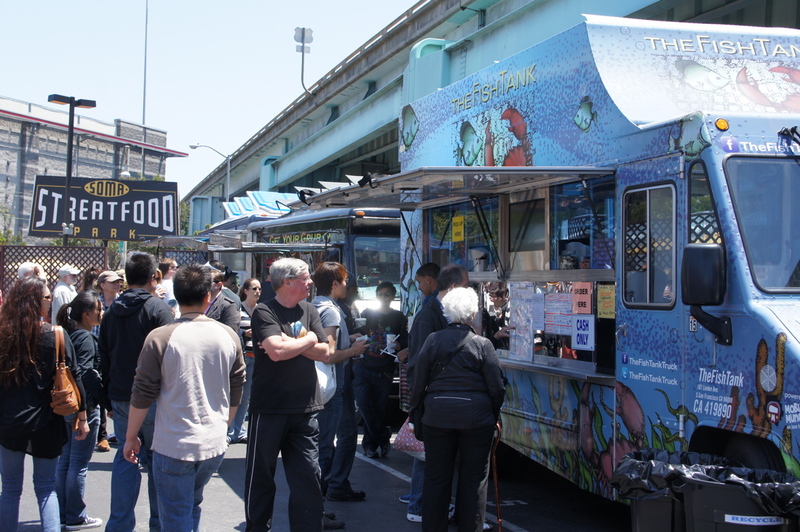 Another place to find food trucks is at various Farmer’s Markets in the Bay Area. The Ferry Terminal Farmer’s Market on Saturday has the Roli Roti truck, which has chickens roasting on rotisserie grills with their juices dripping onto roast potatoes below. 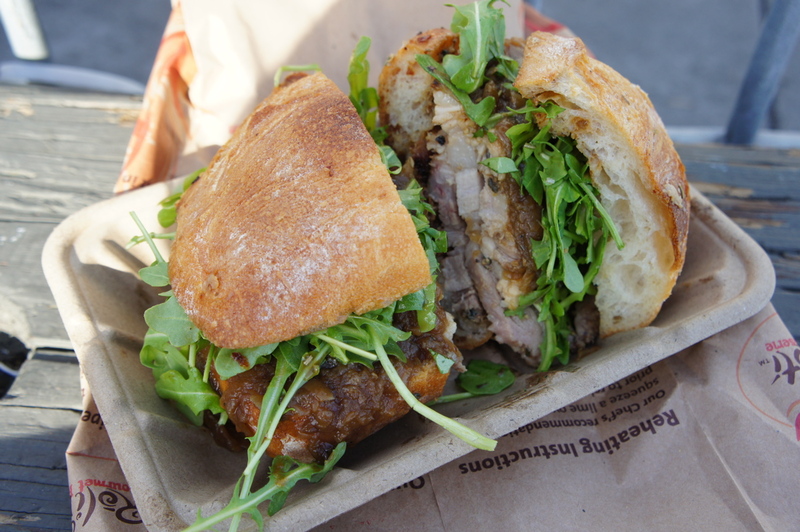 Roli Roti also serves one of my favorite food truck items, the porchetta sandwich. 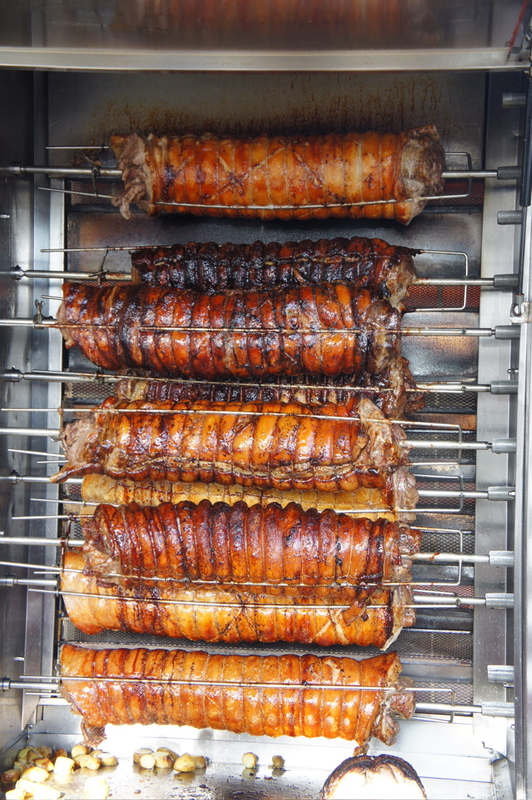 They take pork loin, herbs, and spices and roll it in pork belly and roast it on the rotisserie. Slices of juicy meat and crackling skin are served with sweet onion marmalade, greens, and a crusty roll. 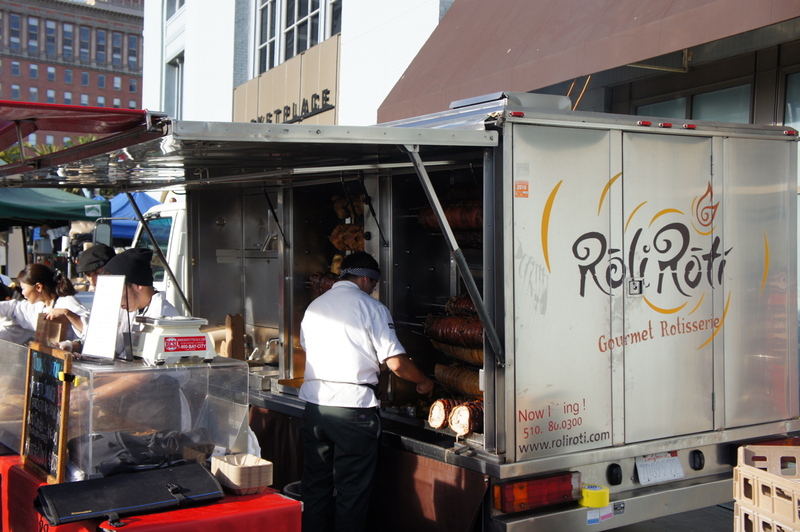 Roli Roti also comes to other Farmer’s Markets and locations, but they only sell porchetta at the Ferry Terminal, unfortunately. I am a big fan of all of the new food trucks. It’s a great way for aspiring chefs and entrepeneurs to start their own food businesses. 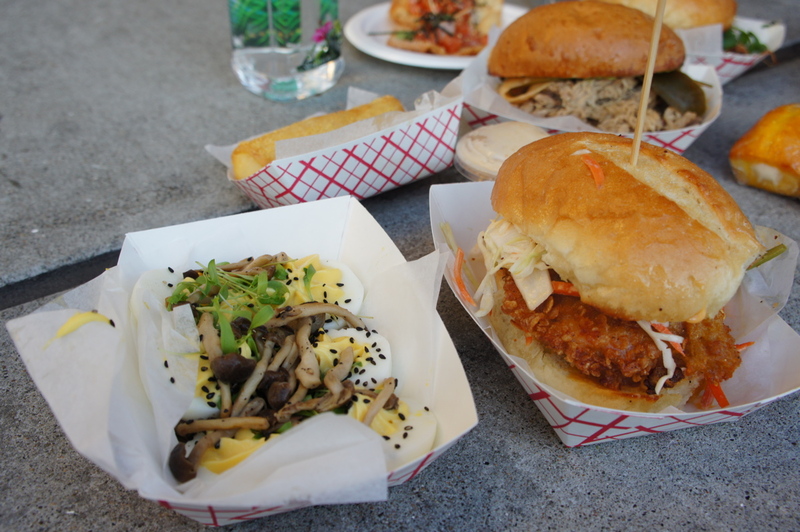 Some, like Mission Street Food, have parlayed their success into actual restaurants. The trucks take advantage of social media, announcing their locations on Twitter and Facebook. 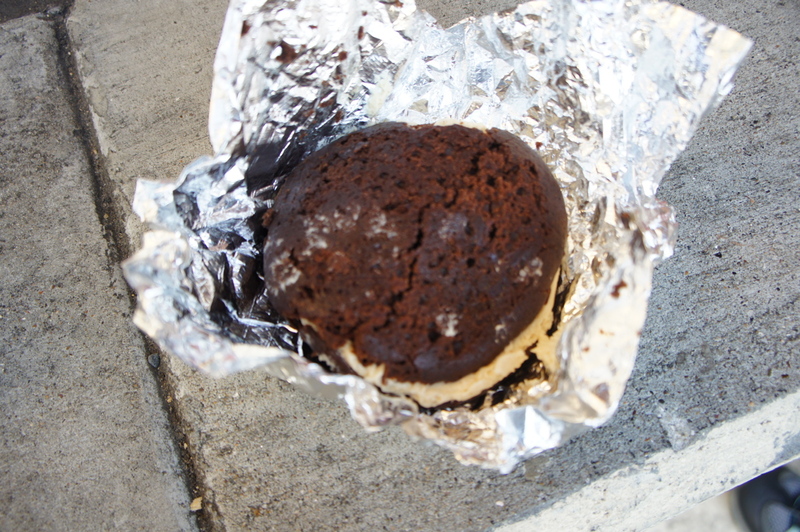 They have been featured nationally on Food Network’s The Great Food Truck Race. There is a great variety of food being served: Indian, barbecue, seafood, creme brulee, cookies, Belgian waffles, Japanese, French. 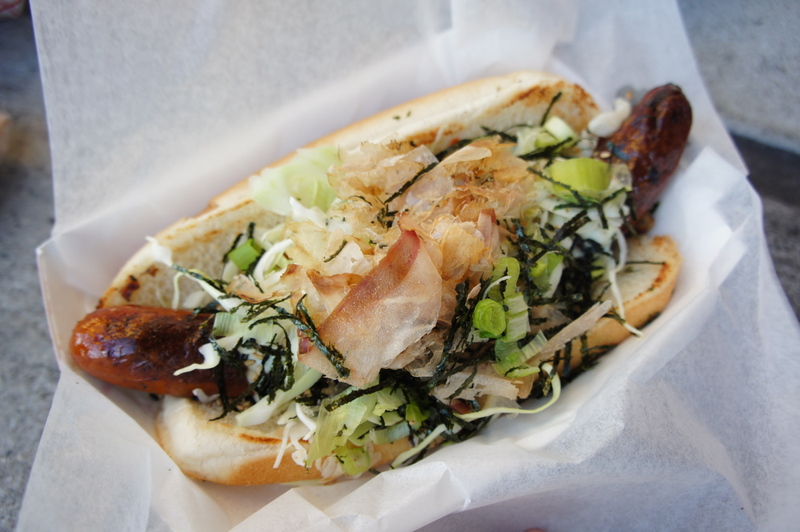 Sometimes, the food from the food trucks can be a bit overwhelming. 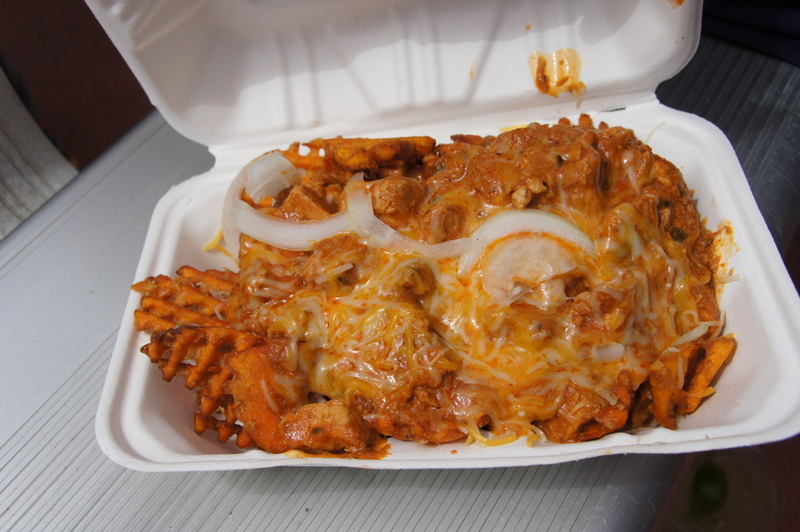 A couple of examples: waffle fries drowned in chicken tikka masala and melted cheese; a sandwich of panko-crusted fried chicken, pulled pork, cheese, bacon, a fried egg, and slaw on a brioche bun. Not subtle, but it doesn’t have to be. There’s so much variety out there now that there is something for everyone. 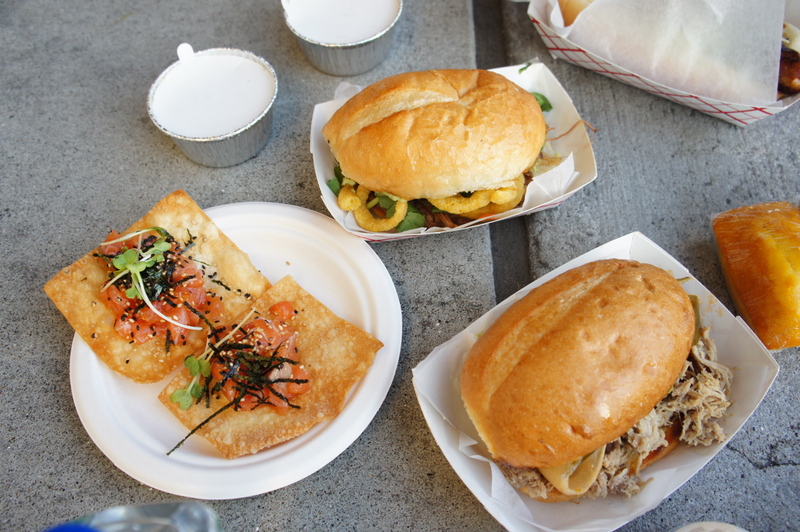 Update May 2013: Just went to the Picnic at the Presidio food truck event sponsored by Off the Grid. I think it’s a really great setting. Link here. Wow, this was a great dish. Bon Appetit July 2012 featured several Malaysian grilling recipes from Zac Pelaccio, chef/owner of New York’s Fatty Crab and Fatty ‘Cue. Chef Pelaccio spent a year in Malaysia and brought back many Southeast Asian flavors to go along with his more classical training. The Bon Appetit feature included four recipes for grilling, and I tried the chicken recipe and paired it with the grilled vegetable recipe. A marinade is made by blending together turmeric, coconut milk, jalepeno, shallots, lemongrass, ginger, garlic, fish sauce, lime juice, and tamarind concentrate (which is sold at Ranch 99 in California.) I used boneless, skin-on chicken thighs, but the recipe calls for chicken wings. After the chicken is marinated overnight, the marinade is heated in a saucepan and divided in half, with half being used to baste the chicken during grilling and the other half used as a dipping sauce at the table. This is an interesting technique I have not come across before. Bon Appetit mentions layers of flavor, and this analysis is spot on. The marinade infuses the meat with a ton of flavor. The crispiness of the skin from grilling leads to more flavor via the maillard reaction. The marinade as dipping sauce adds yet more flavor with the delicious combination of coconut milk, heat from jalepenos, spice from turmeric and ginger, sweetness from tamarind, and brightness of the lemongrass. Definitely worth doing and adding to the repertoire! The grilled vegetable recipe, Grilled Vegetable and Rice Salad with Fish Sauce Vinaigrette, nicely complements the chicken and was good, but not at the heights of the chicken recipe. A mix of grilled vegetables (corn, okra, zucchini, eggplant) are dressed with a vinaigrette made from pureed Anaheim peppers, garlic, fish sauce, lime juice, and sugar, which gives the vegetables a bit of Southeast Asian flavor. Link to grilled chicken recipe here. Link to grilled vegetable recipe here. There are certain combinations of food that go together perfectly, and such is the case with lobster bakes (also known as clambakes) in New England. 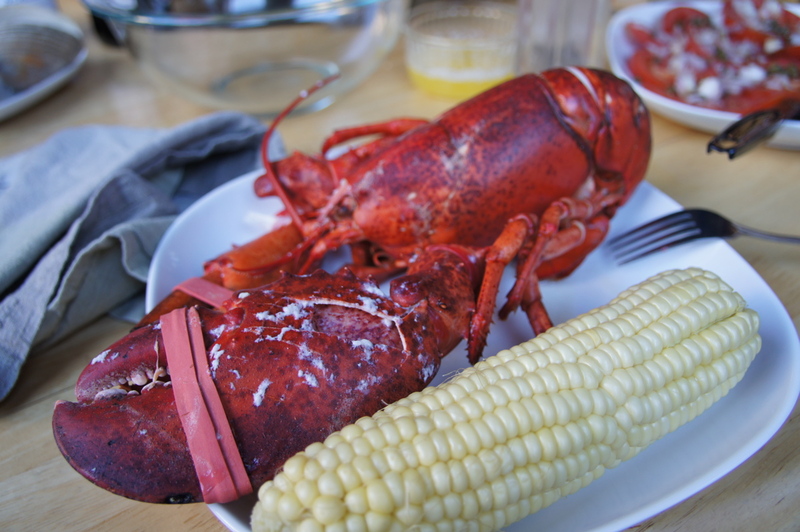 Lobster, clams, corn, potatoes are traditionally steamed over several hours in a fire pit dug in the beach. For the home cook, preparation can be significantly simplified. 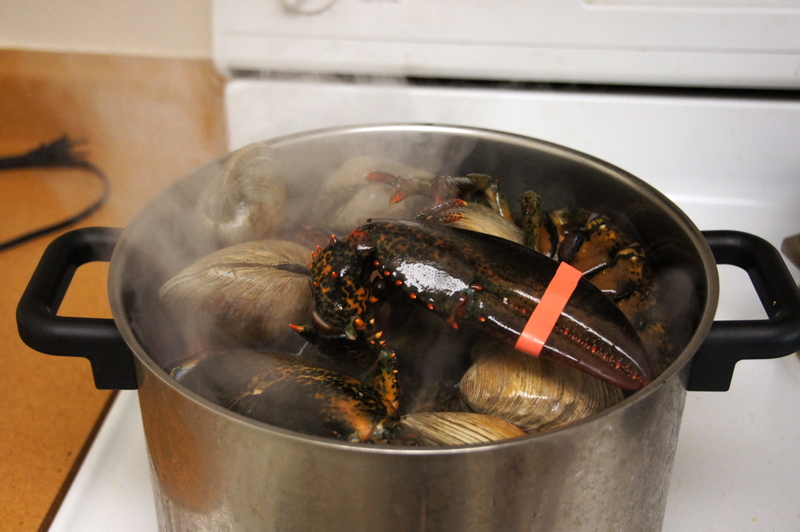 You need a big pot with a tight-fitting lid, filled with an inch or so of water, and a steamer tray or wire rack to pile on the lobsters and clams. For one person, figure about a 1 1/4 to 1 1/2 pound lobster (live lobsters currently about $9/lb at Ranch 99 in California.) With the accompaniments, that should be more than enough. You can also add in some sausage like chorizo, andouille or linguica, but that is not necessary, given the glorious flavor of the lobster. Jasper White is a Boston-based chef famous for seafood served at his Summer Shack restaurants. His cookbook suggests the following cooking times for male lobsters. 1 1/4 lb 12 minutes. 1 1/2 lb 14 minutes. 1 3/4 lb 16 minutes. 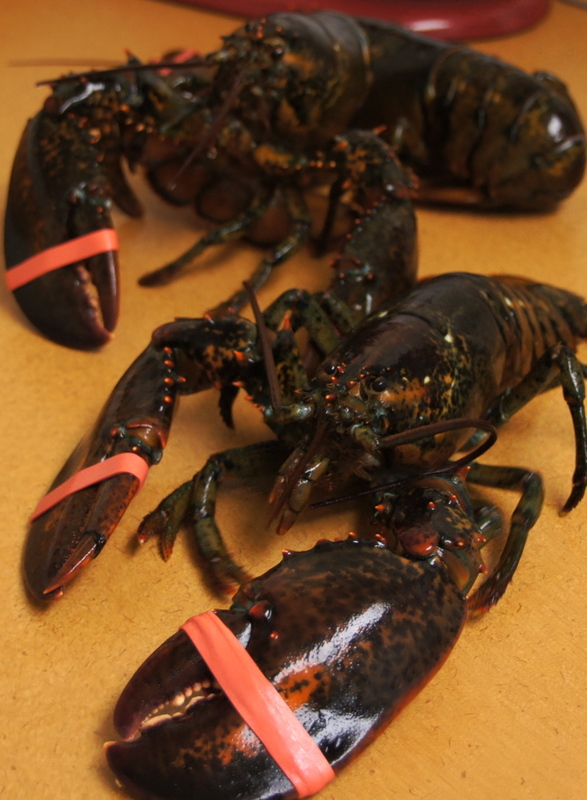 Female lobsters in the summer months that carry roe that must be steamed for an additional two minutes at the same weight. Since it might be hard to tell the difference between male and female lobsters, I just go with the longer cooking times. A couple of suggestions for eating. Lobster pliers or a big cleaver are essential tools to crack open the shells. A bib or napkin will protect your clothes from the inevitable flying bits of lobster from the lobster cracking process. A big bowl in the middle of the table can be used to collect all of the spent shells. Don’t forget the meat in the small walking legs – they are like little lobster popsicles. The soft green digestive gland (tomalley) and eggs (roe) inside the body cavity can be eaten too, although their flavor is not for everyone. Drawn butter is the traditional dipping sauce for lobster. It is made by melting butter over low heat, swirling constantly to try to prevent the flavorful milk solids from separating, which is easier said than done. Add a little bit of salt and that’s it. 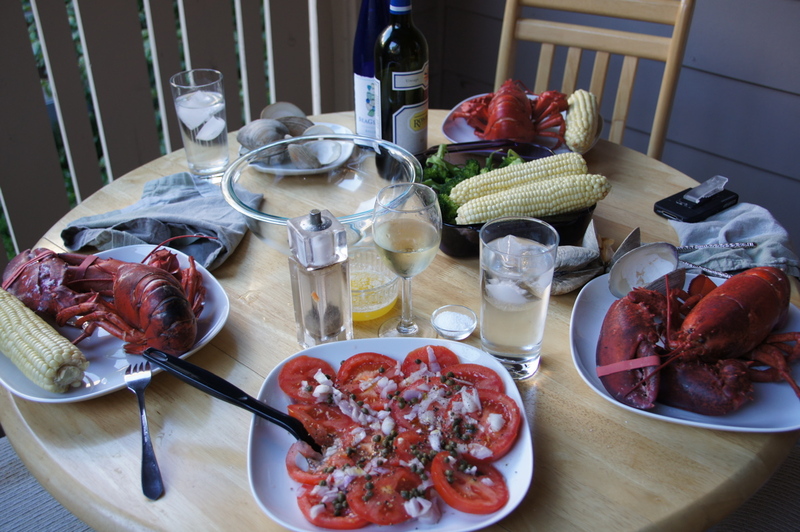 Small red or white new potatoes will usually take longer to cook than the lobster, so they can be boiled separately, for about 20-30 minutes until done. The corn can be cooked in the microwave or boiled with the potatoes. A tomato salad with shallots, lemon, olive oil, and capers and some steamed broccoli are great, simple side dishes. The lobster is the star! Amazon link to Jasper White’s Summer Shack cookbook here. Delicious ice cream dessert from Bon Appetit June 2012. There are two easy components. First is an apricot compote where chopped dried apricots are rehydrated over low heat in a simple syrup. Second is a crumble made from flour, oats, light brown sugar, butter, salt, and cinnamon that is baked at 350 for about 15 minutes. These two components are cooled and then layered with vanilla ice cream. The whole dessert can be frozen 30 minutes to set, or just eaten right after assembly. Fresh stone fruits like nectarines or peaches would be a good substitution for the apricot compote. 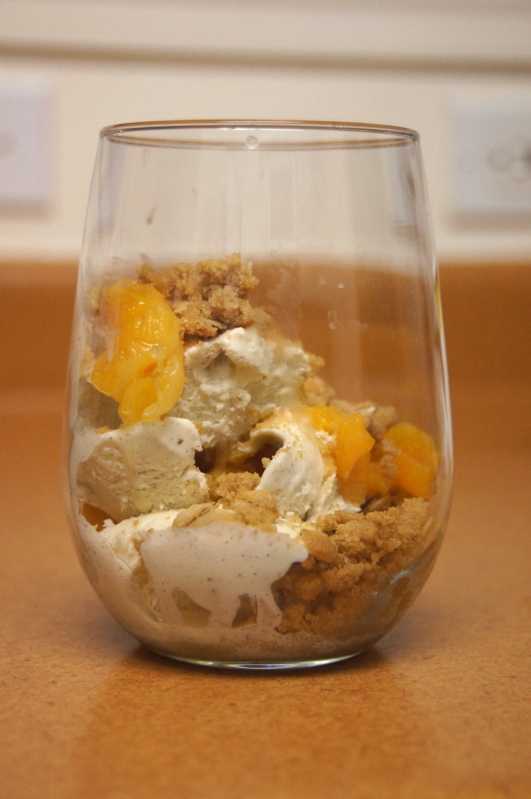 Nice and easy summer dessert! Subscribe to Bon Appetit here. This recipe is from Bon Appetit June 2012 and Chef Jeff Cerciello’s Farmshop restaurant in Santa Monica, CA. Flank, hangar, or skirt steak is marinated in a spicy citrus wet rub and then cooked on the grill (or grill pan if preparing indoors). The steak definitely needs to be seasoned well with salt to enhance the flavors of the marinade. An important step in preparing any steak is to let the meat rest after grilling, which allows the meat to cool enough such that the juices in the steak distribute evenly within the meat instead of spilling all over the plate (see a detailed explanation from The Food Lab). 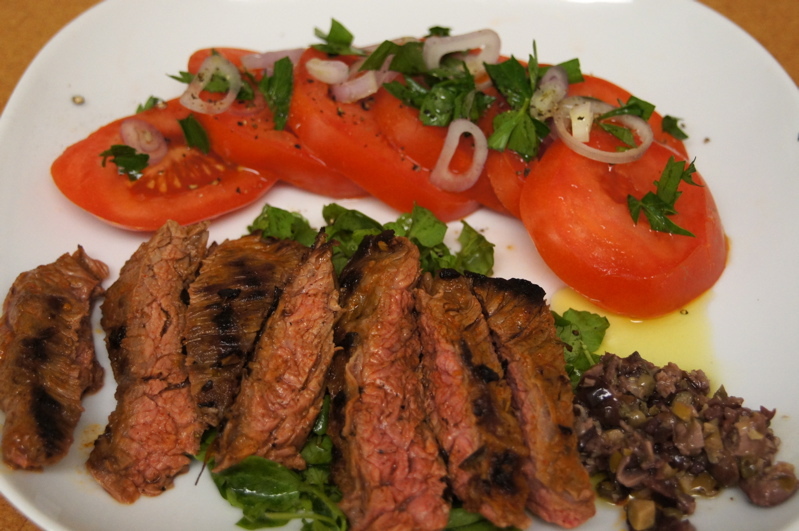 A key component of this dish is the olive and caper tapenade, which contrasts nicely with the steak and the tomato salad. The steak is paired with watercress and a fresh tomato salad, best made with heirloom tomatoes instead of supermarket beefsteak tomatoes. There was a recent article in the New York Times about how engineering the perfect-colored supermarket tomato has had the unintended consequence of sapping the tomato of flavor since the critical gene mutation is important for both color and flavor. No wonder those beautiful supermarket tomatoes taste so bland! 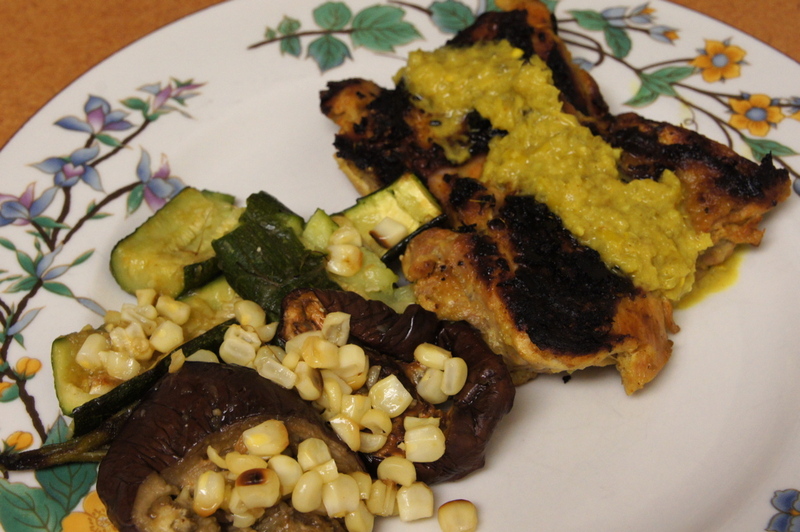 Overall, the dish turned out pretty well, and it’s a pretty easy summer dinner. Note: Leftover marinade works well with chicken.